William is seventeen-years-old, he's being forced to move across the country and live with his biological father - a man he doesn't have any memory of. Before he even begins to settle into his new home, a little boy named Patches, and a strange homeless dog draw him into newly complicated situations, which are not only dangerous but also at times sickening. William soon finds out that Patches is the recipient of severe sexual abuse. For mysterious reasons William, Patches, and the strange blue-eyed dog are all connected. It seems that his new friend (possibly even girlfriend), Shasten, holds the power and answers to help him figure out why. In the end, however, only William will be able to make the right choices that can save Patches. Breath to Breath is a story told in verse and inspired by a true story. 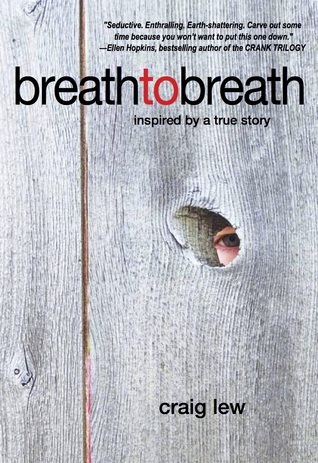 "To survive you hold your breath, but to live you must exhale." I've already admitted in the past that I have a weakness for poetry and this book is no exception. I can also honestly say that readers who are unfamiliar with reading stories in verse and don't usually enjoy poetic language/style will almost certainly enjoy this book. Lew creates a story that reads like prose, but makes the reader feel the poetry inside. He grabs the reader with insightful line breaks, word choice, and style that are easy to appreciate without consciously thinking about them while reading. I loved how Lew was also able to use the different poem breaks to create strong pacing. You won't want to put it down once you start. This can happen in prose as well, but poetry always does it in a more graceful way. That is my opinion anyway. Admittedly, I was leaning towards giving this book four stars for a time while reading it, but the ending changed my mind and put this book over the edge into five star territory. There is violence and graphic sexual content. These things felt so honest and real though, not forced or overdone. It probably helped to know that this story is based on true events, but I think Lew represented them very well too. This book is strong, depressing, uplifting, and beautiful. I recommend it to anyone who can handle the sexual content and is wiling to dive into a story of profound hurt, in order to find profound healing. I will definitely be reading it again, probably several times, throughout my life.